This is a sampling of sessions from past programming. The final schedule will be posted prior to the program. Check back here for more details. Learn about budget tips, items with inconsistent budget treatment and where to use benchmarking. Review the budget calendar, and learn the levers that drive budgets and how to model them. Review the NBOA 10-Year Long-Range Financial Model. Learn how to manage technology more productively. From outsourcing to improving efficiency to preventing waste on unnecessary equipment, discuss the pros and cons of working productively with other campus constituencies on technology issues. Hear key components of successful facilities management. Discuss the roles of facility manager and business officer. Explore best practices in facility audits and work orders, PPRRSM funding, neighbor relations, campus planning, safety and good communications. Discuss and ask questions about how to communicate with all school constituencies about your school's physical assets. Dig into the issues that are most critical for you and your school with a group of peers. What do you most need to take away from the week? What strengths can you share? What is the enrollment management process? How much of your enrollment process should be online? Are your financial aid processes consistent with industry standards? Do you have a problem account? Learn how other schools have handled challenges with enrollment and student accounts. Address the key insurance coverage and risk management issues facing independent schools. Get the latest updates on best practices in school risk management. Learn how to review core coverage areas and risk management strategies. The business officer's job is multifaceted, so no one knows it all, but a smart business officer knows where to find the answers. Learn about the many resources available to you. Explore NBOA resources (toolkits, forums, library, etc. ), NAIS DASL and other tools. Learn how to do an effective RFP and where to find samples. Do you have an endowment but are not sure of the best practices for managing it in today's volatile markets? Learn important insights that will help you contribute to your investment committee meetings given today's opportunities and risks. For 30+ years, the DISC Profile has opened the door to understanding dynamics that influence communication and relationships. The foundation of success in both of these lies in understanding yourself, understanding others and realizing the impact of your behavior. DISC focuses on four behavioral dimensions: D (dominance), I (influence), S (steadiness) and C (conscientiousness). How can you use DISC profiles to be more successful in your role as a leader at your school? Explore these concepts in a highly-interactive session. Get a strategic overview of independent school financial sustainability to inform discussions with your school's leadership and identify a path forward that supports your mission and maintains your school's financial health for the long-term. Learn various frameworks for thinking about financial sustainability, and how to evolve the conversation about “high tuition” into a conversation about delivering high-quality independent education in the 21st century. Issuing and Managing Debt: What's Right for Your School? Review current trends in loan and bond financing structures. Explore the risks and pitfalls that other schools have experienced with debt. Learn how to work effectively with banks and bankers. Understand what covenants and commitments are involved in borrowing funds. You have a multitude of roles, including a major one when it comes to human resources. This presentation will help you find answers when facing legal issues that are often perplexing and counterintuitive. Dealing with the appropriate classification of employees, preparing enforceable contracts, overseeing volunteers, tracking protected leaves as well as employee presence on social media spaces, and participating in performance evaluations may feel like daunting tasks, but this workshop will help you get on top of what you need to know. Learn the tax compliance issues affecting independent schools. Discover what you need to know about tax law, how it impacts your school and what you can do to avoid costly penalties and interest. The business office handles a wide range of legal issues. Discuss what you need to know about BYOD policies, student bullying and harassment, child abuse reporting and appropriate boundaries between students and adults. Also discussed will be tuition management issues and background checks. Learn to spot issues, reduce your school's risk and recognize when you need to call your attorney. Hear best practices and real-life experiences from a head of school and business officer who understand the importance of this strategic relationship. Discuss these critical roles and their responsibilities through case studies and examples. Develop a greater understanding of each role's perspective, how the two can work more effectively together and how to manage the strategic relationship. Enjoy a roundtable discussion on selected issues. Ask lingering questions and make sure all the pieces of information gleaned over the week are connected. Return to your school with all the information you need. 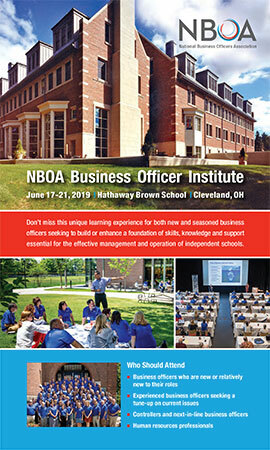 Discuss and learn from challenges and successes experienced by other independent school business officers. NBOA is recognized by SHRM to offer SHRM-CP or SHRM-SCP professional development credits (PDCs). The total number of credit hours available for an individual varies based on sessions attended. For more information about certification or recertification, please visit www.shrmcertification.org. NBOA is registered with the Human Resources Certification Institute (HRCI) as a sponsor of continuing professional education. Sessions that have met the HR Certification Institute's criteria to be pre-approved for recertification credit will be noted in the onsite program. The use of this seal is not an endorsement by the HR Certification Institute of the quality of the program.